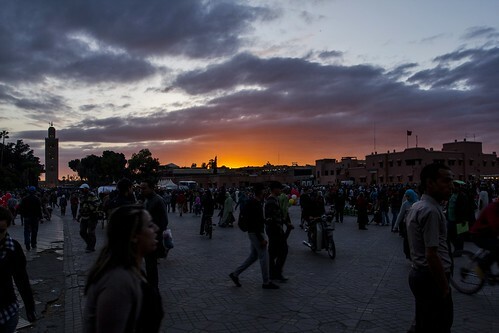 The main square in Marrakech, Jemaa el-Fnaa. Photo by Nellu. In Marrakech, a much more touristy city than Fes, Nellu and I were approached on two occasions by fellow tourists. One time, it was a group of three teachers from the Netherlands, who had gotten lost on their way to meet their students. When we ran into them on our way back to our riad, they had already been marked by a few teenagers, who continued to circle their prey. Since we couldn’t figure out where the teachers were going, we brought them home with us. I thought our host, Samata, would be able to give them directions they could count on. It was at least a five minute walk through winding streets and a few dark narrow alleyways, but they chatted happily to us as we led them. Samata was there when we walked in. He pulled out a prepared map and highlighted various landmarks on a path crossing the main square, Jemaa el-Fnaa, on the way to their restaurant meeting place. Nellu and walked with them again, just to make sure they got there. To be honest, I don’t know if I would have followed him, but I would have definitely followed me. I’m approachable. Nellu’s intimidating. We’re an oddly effective combination. There is one group of people in Marrakech who did find Nellu approachable, however…the drug dealers. He must have been approached four or five times during the few days we were there. (He swears it happened every time we went out.) But what was truly fun about these encounters was the way they told him what they had to offer. Instead of whispering in Nellu’s ear, it looked like they were trying to whisper into his mouth. “Hashish,” they would say directly at his mouth as he walked by. It was awkward to watch because Nellu actually walks quite quickly. These guys had to keep up with him, try to whisper into his mouth, and avoid running into people, bikes, carts, walls, etc. I know at this point in the story you’re probably thinking, “And, why would I want to go to Morocco.” It’s not as sketchy as it may sound. These are just the quirky stories I write before the paragraphs where I talk about how great everything is to keep it interesting. Great = boring. Dealers whispering into the mouths of potential customers—interesting. I highly recommend Morocco for all of our U.S. friends (and European friends) because it’s close enough for a week-long trip, yet exotic enough to make you feel like you’ve really traveled. 1) You can write off a visit to a Hamman/spa as a “genuine cultural experience.” A hammam is either a steam room or a bath. The steaming is usually followed by an intense black soap exfoliation, which was much appreciated after our months on the road. 2) They tolerated my bad French and even pretended to understand my small talk regarding the weather. 3) Everything is beautiful. Seriously. 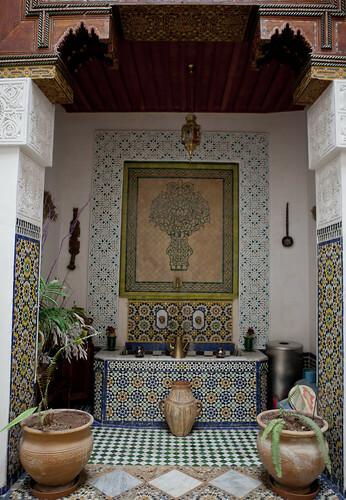 In the States our neutral decor is beige, in Morocco it’s elaborate colorful patterns. 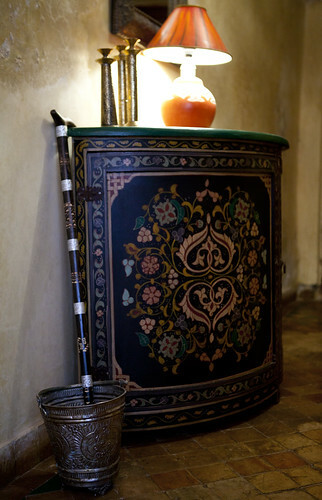 The console in the entrance to our riad. So go, bring an extra bag to fill with all the leather you buy and maybe a side table for me, and ask other tourists for directions to the best souks. I have to admit. After two weeks in Spain, I was hesitant to go back to Africa to go to Morocco. It was the middle of March and we were well into our 11 month of travel. A road weariness from bad weather and culture shock had set in. The indulgence of Western Europe with its Carrefours full of wine and cheap food that we recognized, wifi on public buses, and a language we had some hope of understanding, was too good to leave. Not to mentioned that in Spain, we blended in. This last point was a major one in my book. 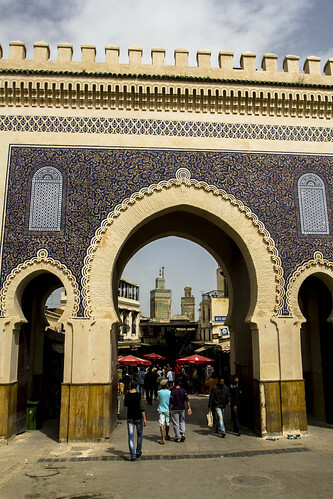 From what I’d heard about Morocco, it was filled with seriously aggressive touts, the kind who see you coming from a mile away, run to meet you, and spend the next 20 minutes trying to get you to buy something with tactics ranging from veiled threats to badgering you into submission. My wherewithal for dealing with these characters was almost gone. Why go then? Simple, it’s Morocco. It’s exotic. I’ve always wanted to go. We were so close. And besides, it would be warm, like summer warm. The promise of a week of sustained hot sun was very enticing. In Morocco, the everyday is exotic. In the end, we drove a car for two hours from Granada, Spain, took a taxi to a bus to a ferry to a bus, walked to a train station, and took two trains for four hours to Fes. The riad, a traditional Moroccan style home, we had booked for the next three nights offered a pick up service, which we gratefully took. 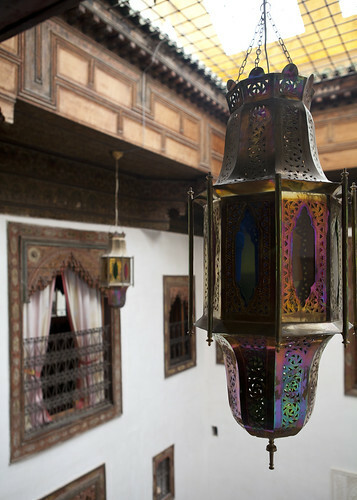 Our riad, Dar Melody, was nestled into a maze deep in the old city, the medina, of Fes. We would have never found it if we hadn’t been led their by its owner. One view from our room in the riad to the courtyard. When we met an American woman from Boston in Amman, Jordan, we chatted casually with her at breakfast about the places we’ve been. (I guess I was only half paying attention. I was too busy suppressing envy over her fresh looking yellow sweater and corresponding cotton chiffon scarf with the subtle matching pattern. Oh to be able to wear fresh looking, well-coordinated outfits again!) In retrospect, I remembered her telling us about visiting Fes. She stayed in the new city. 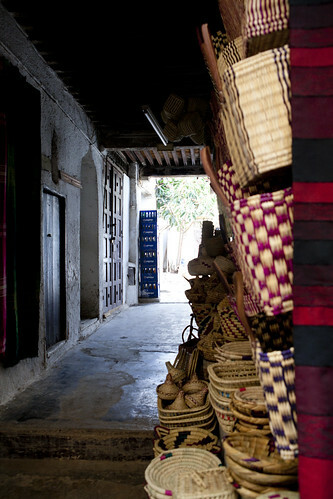 She recommended us visiting the old medina but certainly not without a guide. “You’ll get lost without a guide,” she told us. I tried to find a good aerial shot of the medina to give you a better idea of what we’re dealing with but I couldn’t find one that does it justice. Do you remember the movie “Labyrinth“? It was like that, crazy characters and all. 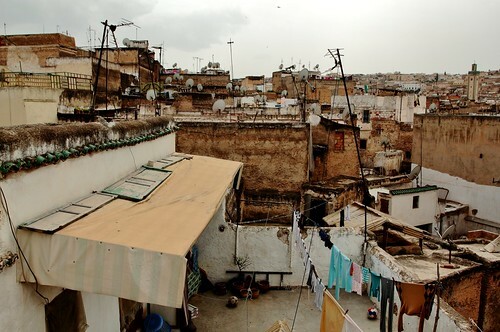 Here’s a picture Nellu took of the medina from the rooftop of our riad. You get some sense of the chaos but being above it is relatively calming compared to being in it. So off we went. Up and down, round and round. The first time we went out into the mess, we got really lost. We spent much of the day trying to find one of the gates, which we didn’t. We did walk by a very cool mirror shop though…two or three times. 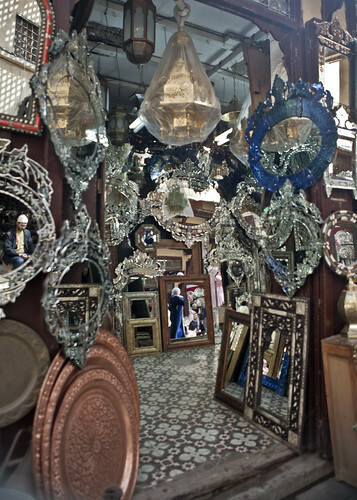 House of mirrors in the Fes medina. 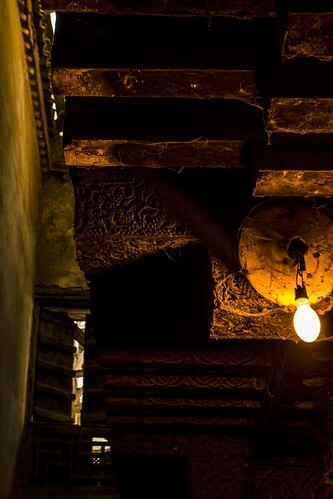 The Fes medina maze is a very complex, collection of chaotic pathways that weave up and down through narrow spaces between buildings. There are a few sign posts hung from these buildings, but not necessarily when you need them. We walked around in many circles trying to follow the signs. The alleys are too thin and crooked for cars so traffic consists of a heavy mix of people, carts, donkeys, and scooters, sometimes all descending on an intersection at the same time. 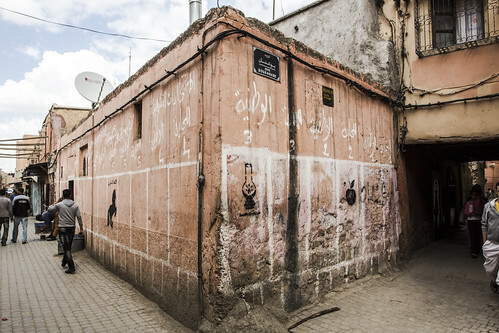 One of the wider, emptier alleyways in the Fes medina. The medina is also quite large. Allegedly, it’s only four square kilometers. But even when we knew where we were going, it still took us no less than 35 minutes to walk from our riad to the other side where many of the restaurants were located. The other issue is that the appearance of the alleys will change throughout the day. A “street” looks a lot different when the shops are open and wares laid out than when everything is closed. View from the outside of one of the main gates looking in. We finally found the gate!!! Photo by Nellu. Our huge success the first time we went out into this craziness was getting back to our riad. I know this sets the bar low for what counts as a success but to be completely honest, we’d gotten into the habit of congratulating ourselves everyday for surviving. “Another successful outing,” Nellu would say, and then we’d high-five. Dorky, I know. But this is what happens when you hang out with the same person everyday, almost non-stop for a year. And on our first day in Fes, getting home was worth celebrating. Now the touts in Morocco weren’t quite as bad as I expected. The real touts that is. They shout at you in French, which doesn’t seem as aggressive as English, mostly because I can only understand half of what they’re saying. What is a little unsettling, however is the roving teenage boy mobs. Their favorite phrase is “c’est fermé” or “it’s closed.” We found this comical because they obviously assumed they knew where we were going. We didn’t even know where we were going. In most cases, we were just wandering around trying to see what we could find. Yeah, sometimes we were looking for specifics but we certainly weren’t going to trust them. Telling tourists something is closed is a popular scam all over the world. Most often it’s used to redirect you to shops or attractions where your new, kind, altruistic tour guide is getting a kickback for bringing people in. In Morocco, the kids use this tactic to get you to follow them on a wild goose chase that ultimately ends in tip extortion. The longer they lead you around in circles, the larger the payout they’ll demand for their time. It was easy to ignore these kids during the day when many shops were open. But on the way home from dinner, their coy practices shift into intimidation tactics. They can smell the fear and will follow you, heckling you. We got really, really lost again the first night coming home. A pack of five or so boys started taunting us. They said a few insulting things in English—I doubt they even understood what they were saying. These are the moments I am really grateful to have Nellu with me. He makes a good bodyguard and goes from zero to angry man so quickly. His protection instinct is primal…and somewhat belligerent. Our bullies eventually left us alone, and we found our way back. The next night, our last night in Fes, we realized where we had gone wrong and why we had gotten lost. Ironically, it was because shop owners had closed the doors to a bazaar hall that had become our leading passageway to the restaurants. I wish the kids had been more specific when they shouted “C’est fermé.” I would have understood them if they said, “La porte (the door). C’est fermé.” But I guess specifics would severely impact their business model. What’s closed? 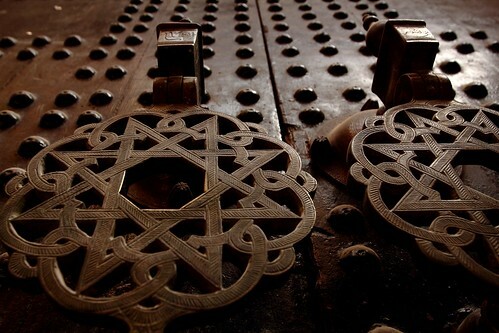 The door is closed. A little more information would have been infinitely useful. Photo by Nellu. It took us two and half days to mildly master the Fes medina and even despite the roving teenage mobs, it was the best part of our visit. Another successful outing! High-five?